The snow is back. For two days in a row this week my 60 km round trip to work and back has again been accompanied by snow. This morning it was snowing gently as I rode to work. This is a problem as the snow gets in your eyes if you don't wear glasses, and if you do wear glasses it settles on the front so you can't see much and you have to wipe regularly. Also, the difference in temperature between inside and out causes glasses to steam up. Not the weather for trying to set any records. During the day the snow continued to fall gentle, and settled on top of my Mango, parked outside the shop while I worked with my colleagues on making new Mangos inside the shop. Occasionally people ask me how the weather is kept out of a parked Mango. The photo shows the two part cover for the top. The larger part is used when riding in the rain or snow, leaving a gap for your head. The smaller part covers the gap when you park. Both can be stored inside when you ride, which is great on a warm sunny day. On a coldish day like today, when it was hovering around freezing point, a T shirt is warm enough inside the Mango with the cover on (plus woolly hat and scarf). Some people like the optional flevobike top. When I got home tonight the odometer of my Mango read 3101 km. That's how far I've ridden my the Mango since I started riding it on the 9th of October last year. Most of the distance has been ridden in the dark morning and evening commutes three days a week. I quite like riding in the dark. You see a lot of other cyclists here even in the dark and in winter. It's safe on the cycle paths which make up over 28 km of my 30 km commute. Apart from the commutes there have also been several day rides, and these have often been in snow too. However, due to the completely enclosed drive-chain I've been able to this without any additional horrible jobs like cleaning the chain. In fact, it's needed nothing more than the seat cushion washing and a bit of a polish to look nice. That's real practicality. Today at work we sent out press releases, in several different languages, for the latest Sinner Mango offering: The Sinner Mango Sport. This is one of the lightest weight practical velomobiles available, weighing just 27.5 kg - a much lighter weight than my own Mango, achieved with different techniques for building the shell and a change to the components used. There are more details on the Ligfietsgarage website, on various blogs and websites which have responded to the press release, and also quite a lot of photos, including of the internals, on the Sinner facebook page. There are more stories about the Mango, snow and ice treatment and winter riding. 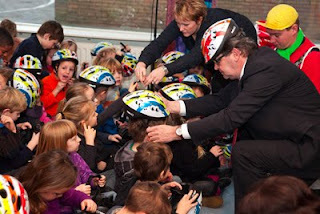 The Dutch concept of "Duurzaam Veilig", Sustainable Safety, has lead to this country having some of the safest roads in the world. 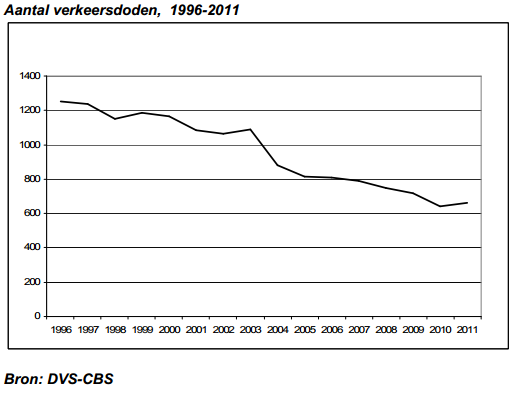 Over ten years, between 1998 and 2007, the number of traffic fatalities in the Netherlands fell by an average of 5% per year due to the policies within the framework of "Duurzaam Veilig". 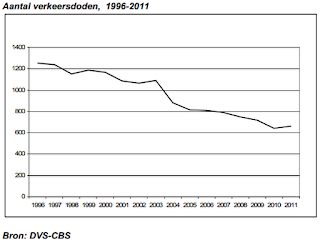 This is a decrease of 300-400 deaths overall, more than a 30% improvement in safety for the already relatively safe Dutch road network. 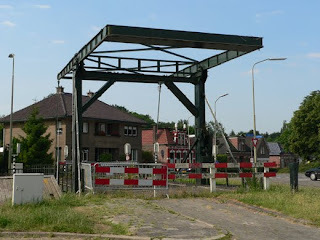 So what is "Duurzaam Veilig" and what does this mean ? Let's start with what it is not. Frequently I see from the UK that there are calls for drivers to be better educated, for cyclists to be better educated, for pedestrians to wear brighter clothing so they are seen more easily and to take the responsibility for avoiding being hit by motor vehicles. This is not sustainable safety. Sustainable safety is not about punishing people for making mistakes, but about preventing those mistakes from occurring. While a good level of education of drivers in particular (as they are the ones bringing lethal force to the roads) is important, it is never possible to completely eliminate the chance of error, or of frustration leading to violent behaviour, if conflict is designed into the way in which roads are used. What's more, people are often tired or distracted. These things cannot be solved by education, they are a result of being human. 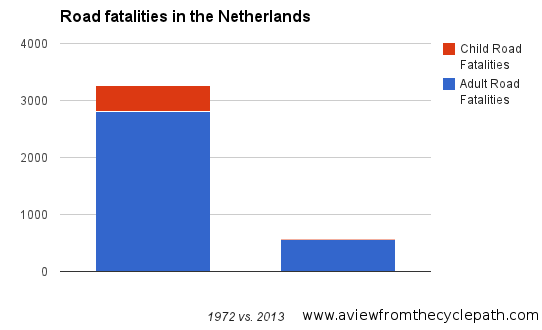 What the Dutch have done is to reduce the frequency of conflict between road users and to to reduce the lethality of those crashes which still inevitably occur. This has involved changes in infrastructure to keep vulnerable road users away from the lethal force of motor vehicles, design of junctions so that routes do not cross each other at speed, as well as some changes in the law and education of road users about how to behave in a safe way (i.e. drunk driving, taking a break on long journeys...). Speed limit reductions are a useful tool, both in town and in rural areas (but note that merely posting speed limit signs is not enough on its own). Out of a total of 120000 km of roads in the Netherlands, 41000 km have had the speed limit reduced from 50 km/h to 30 km/h roads and over 33000 km have been reduced from 80 km/h to 60 km/h. From the article: "Currently over 70% of all 30km/h neighbourhood connector roads have speeds reduced at intersections and/or stretches of road, and 45% of 60km/h roads." It is estimated that 51 to 77 traffic fatalities were prevented by the 30 km/h roads and 60 more due to the rural 60 km/h roads. On many of the 30 km/h roads, measures have been taken to exclude cars. Also, roundabout construction is credited with saving an estimated 11 lives. 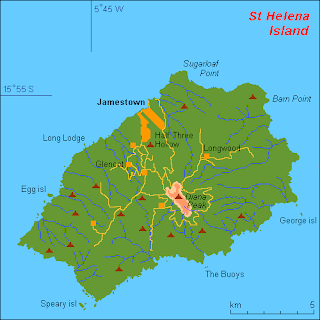 However, it goes beyond this. Traffic light junctions in the Netherlands do not work in the same way as similar junctions in the UK. In most cases, drivers who have a green light can go without having to negotiate with other drivers or cyclists who also have a green light but who are travelling in different directions. The conflict between, for instance, cyclists travelling straight on and motorists turning right has been removed by junction design. What's more, cyclists can avoid many traffic lights therefore avoiding all the danger caused by those junctions. The measures have proven to be socially cost-effective, as benefits are a factor of four higher than costs. It's a common theme with Dutch policies concerning transport and in particular cycling that measures are not seen as a cost, but as a benefit. The Netherlands is a rich nation, in part due to sensible design of roads. Of course it's all OK to have the world's safest roads, but to influence people to ride bikes you also need Subjective Safety to make cycling feel safe enough that people want to do it, and want their children to do it too. This has been addressed by a number of means, leading to the world's highest rate of cycling, and happily the same things which increase real safety and work for sustainable safety also work to increase subjective safety. The result is the highest rate of cycling in the world, with very high participation by the broadest possible population of cyclists, and what this means sometimes takes people by surprise. Read also another blog post which explains about the importance of Sustainable Safety. Also about how the necessary segregation of cyclists from drivers is achieved even without cycle-paths because cycling routes are unravelled from driving routes. Mike Rubbo recently made this film about Jackie Fristacky, the Councillor for Nicholls Ward, City of Yarra which is located in Melbourne in Australia. Over here, it's nothing special to be a "cycling councillor." In fact, quite the reverse. When 93% of the population ride a bike at least once a week, it would be a brave councillor who tried to get elected with any kind of anti-bike message. In this country, the royal family ride bikes, and do so publicly in part because it's a way of connecting with the public and appearing a bit more normal rather than aloof. However, in Australia it is not the same, and Jackie is sticking her head out in being a "cycling councillor." It is perhaps not a co-incidence that she represents the area with the highest cycling rate in Australia. 9% of commutes in Yarra are by bicycle, which is vastly higher than the average for the country as a whole. many local workers like to attend a bar or the like after work and having a car hampers them with restricted parking, drink driving etc; a bike gives more flexibility and less likely to be DUI. What is my point in presenting this ? I believe there is always a reason why people cycle more in some places than they do in others. You see the same thing even here in the Netherlands. Some cities have higher cycling rates than others. There is always a reason why. The challenge is to transform the rest of the city, even the rest of the country, so that conditions there are also conducive to cycling, and to keep on doing so in order to continue to increase the cycling rate. Commuters are a start, but they only get you so far. For a sustainable improvement, infrastructure needs to be designed to make it possible for a wider demographic to take to bicycles. For now, let's be happy with what Yarra has achieved so far: The highest cycling rate anywhere in Australia. Yesterday was the Noordelijke Velomobieltocht - Northern Velomobile Ride. It was organised by Peter, who lives a few hundred metres from me here in Assen. We had a bit of snow overnight, and I set off into it with a sparkling clean Mango which I'd washed the day before. Peter's route took us through just short of 60 km of Drents countryside. It all looked beautiful in the fresh snow which had fallen overnight. We stopped for lunch and there was delicious soup provided when we returned to his home at the end of the day. You can also see a few more photos on picasaweb. Other participants also documented the ride. We didn't have such a big group as the Oliebollentocht a few weeks ago, but it was a very pleasant event all the same. A group of us go on similar rides most weekends. All Dutch railway stations have mass cycle parking. This video from Radio Netherlands Worldwide shows a newer cycle parking facility at Zutphen railway station in contrast with an older one at the station in Wageningen. The new facility is designed to be more comfortable for cyclists to use, as well as more secure against cycle theft. Wageningen's population is just 36000 but there are thousands of spaces for bikes at the station. Zutphen has a population of just 47000, and over 3000 cycle spaces at the railway station. That's one space for every fifteen residents. In absolute numbers it's actually more than London, a much larger city with 8 million inhabitants which provides spaces for just one in every 2800 residents to park a bicycle at all of its fifty railway stations combined. Note that the video was made last winter while there was snow on the ground. The cycling rate in the Netherlands only drops about 5% in the winter, so most people were still cycling and the bike racks were still full. On Sunday mornings there is a regular ride of local recumbent enthusiasts, called the huneliggers. This morning the temperature was -6 C ( 21 F ) and there was 12 cm ( 4.5 inches ) of snow, but that didn't stop a few of us going out. First there were Peter and myself, we met Anton along the way and visited Ritsert at home. In all a ride just short of 70 km, and a lot of fun. 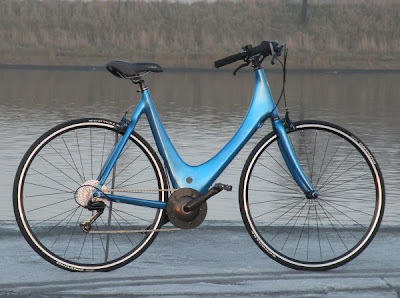 Peter also wrote the ride up on his blog, and in two weeks from now, Peter is leading the Noordelijke velomobieltocht starting here in Assen. The video gives a taste of what the event could be like. There are more posts about huneliggers rides, or if you want to join in, go to the huneliggers website. 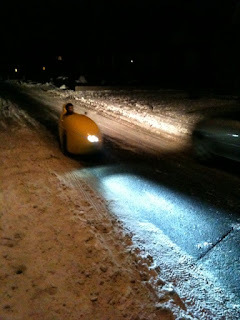 The bike I was riding was again the wonderful Sinner Mango velomobile. On days like this it makes a big difference to comfort to be out of the wind, and it's wonderful to be able to just wash down the outside and not have to bother about cleaning the chain (completely enclosed) or other parts after such a ride.